Notes: Taken from cd entitled: "Sing America." My country 'tis of thee, Sweet land of liberty... 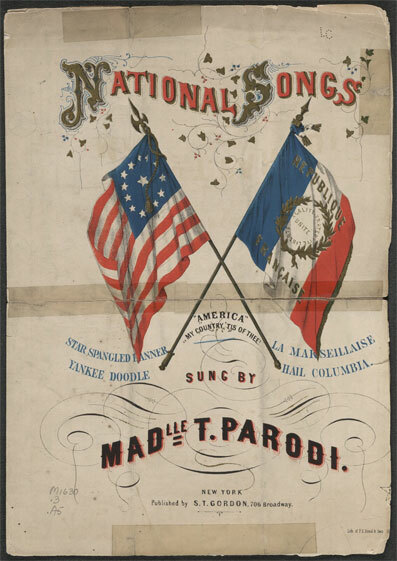 Although we know that Reverend Samuel Francis Smith wrote the words to "My Country 'Tis of Thee" (also known as "America"), the origin of the song's melody remains a mystery. And the history of its verses is even more complex. The son of Henry Carey, a British singer-composer, claimed his father was the first to compose both the words and the music of this tune as "God Save Great George the King" in London in 1740. However, Carey's son had financial reasons for making such a claim, and music historians argued it was more likely any such tune would have been based on a pre-existing melody. Such an earlier melody, if it did exist, has been attributed to various seventeenth-century sources including the English composer John Bull, the French court composer Jean-Baptiste Lully, and even a military hymn from Switzerland. Although the tune's exact origin is not confirmed, it was printed in England in 1744 in the tune book Thesaurus Musicus. The performance that led to an explosion in the popularity of "God Save the King" took place in London in September 1745. Dr. Thomas Arne arranged the tune for a September 28, 1745, performance at the Drury Lane Theater. It was also performed concurrently at the Covent Garden Theater for several nights running. The song was intended to show support for the Hanoverian King George II, following the defeat of his General John Cope at Prestonpans, a battle that was the opening salvo in the war against "Bonnie Prince Charlie," his Stuart rival for the throne. The words that eventually became a tradition, particularly among U.S. school children, were written by Samuel Francis Smith while he was studying at Andover Theological Seminary in 1831. Smith was approached by the famed organist and composer Lowell Mason who had with him some German school music books. Mason wanted Smith to either translate the German, or write new text for the tunes. Smith was particularly struck by one tune (most likely unaware that it was the same melody as "God Save the King") and wrote his lyrics to it. The song was debuted by Mason on July 4, 1831, at a children's service at the Park Street Church in Boston, Massachusetts.